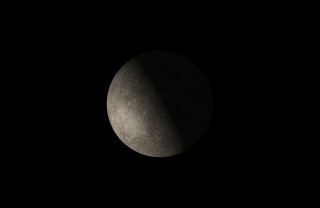 The early-morning planet Mercury is visible all month long in October 2015, with observers in the Northern Hemisphere having a better view than those in the south. In case you haven't yet set your alarm clock to normally awaken you at, say 5:45 a.m., this is most definitely the time to do so. Over next three weeks, we're going to be treated to a show being staged in the eastern twilight skies by three bright planets: Jupiter, Mars and Venus. And the often hard-to-spot planet Mercury is joining the show, too. Presently, Jupiter, Mars and Venus can be seen in the predawn sky stretched out in a diagonal line in that order, going from lower left to upper right. But the thing that is so fascinating is how these planets appear to change their positions relative to each other from one morning to the next. And if three bright planets aren't enough for you, how about we add a fourth to this celestial array? That's where the "elusive" planet Mercury comes in. Nonetheless, from now through the end of this month, we will be presented with an excellent opportunity to view Mercury in the early morning dawn sky. Mercury is called an "inferior planet" because its orbit is nearer to the sun than the Earth's. Therefore, it always appears from our vantage point (as Dr. Asimov indicated) to be in the same general direction as the sun. Interestingly, the time it takes Mercury to rotate once on its axis is 59 days, so that all parts of its surface experiences periods of intense heat and extreme cold. Although its mean distance from the sun is only 36 million miles (58 million kilometers), Mercury experiences by far the greatest range of temperatures: nearly 900 degrees Fahrenheit (482 degrees Celsius) on its day side; minus 300 F (minus 184 C) on its night side. In the pre-Christian era, this planet actually had two names, as it was not realized it could alternately appear on one side of the sun and then the other. Mercury was called Mercury when in the evening sky, but was known as Apollo when it appeared in the morning. It is said that Pythagoras, about the fifth century B.C., pointed out that they were one and the same. On Sunday, Oct. 11, Mercury will shine near the moon making it easy to spot in the early-morning sky. Set your alarms, though. You'll have to get up before dawn to see Mercury. Mercury rises before the sun all of this month and is surprisingly easy to see from now through Halloween. All you have to do is just look well below and to the left of our three other morning planets and above the eastern horizon during morning twilight, from about 30 to 45 minutes before sunrise for a bright yellowish-orange "star." And as an added bonus, be sure to be outside early on Sunday, Oct. 11, no less than a half-hour before local sunrise. Be sure to have a clear and unobstructed eastern horizon. There you will see a razor-thin crescent moon, only 2-percent illuminated, and hovering less than 1.5 degrees above it will be Mercury. Scanning the eastern horizon with binoculars will make it easier, but you should have no problem getting a view of the pair with your unaided eyes. It's at greatest elongation, 18-degrees to the west of the sun, on Oct. 16. With Mercury shining at a very bright magnitude of –0.6 (matching Canopus, the second brightest star in the sky), the planet will rise dawn breaks. It will be Mercury's best morning apparition of 2015. Mercury, like Venus, appears to go through phases like the moon. When October began, Mercury was much dimmer because it was just a skinny crescent. But now the amount of its surface illuminated by the sun will continue to rapidly increase in the days to come. So although it will begin to turn back toward the sun's vicinity after Oct. 16, it will continue to brighten steadily, which should help keep it in easy view over the next couple of weeks. By Oct. 30, Mercury will have brightened to magnitude –1.0, surpassing the brilliance of every star in the sky with the exception of Sirius (the brightest of all stars). Also on Oct. 30, Mercury will appear side-by-side with the bluish first magnitude star Spica, in Virgo. Spica, however, will be only appear about 1one-sixth as bright as Mercury, so you'll probably need binoculars to spot it. Editor's Note: If you capture a great photo of Mercury or any other planet or night sky view that you'd like to share with Space.com and its news partners for a story or gallery, send images and comments in to managing editor Tariq Malik at: spacephotos@space.com.